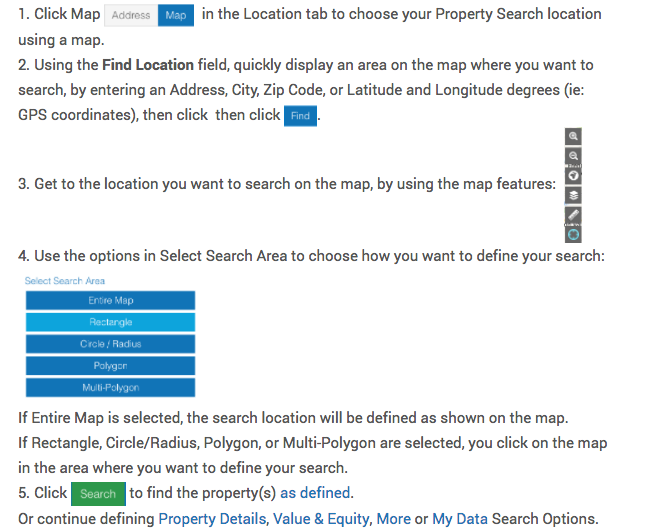 After clicking Property Search in the Main Menu, the Property Search page is displayed. Using Property Search, you can search all properties in our coverage areas, including foreclosures. You select your desired Search Options from the Property Search window. The information you enter into the Search Options, and the searches you save allow you data-driven insight into the market you want. See the Property Search Ideas below for other ways you can use Property Search. To understand what a specific search option means, hover your cursor over the option name to display a popup definition (as shown in the Search Options image). Once you begin typing, the field will auto-fill with possible location information. Select the option you want from the menu list items. You can click Search to find the property(s) as defined. But you will probably want to select other Search Options to narrow down your results, and define more specific property information for your search. Alternatively, use the Location tab in the Search Options to define your Search Location in more detail (using the Address or Map options). to display the Property Search tabs of categorized Search Options. Click the Location tab to enter where you want to search. You can choose either Address or Map to change the way you search. Odd or Even: from the menu, select Odd, Even or Any to select the side of the street you want to search. Street Direction Prefix: from the menu, select Any or a specific street direction: North, East, West, South, Northwest, Northeast, Southeast, or Southwest. Street Direction Postfix: from the menu, select Any or a specific street direction: North, East, West, South, Northwest, Northeast, Southeast, or Southwest. APN(s): enter the Assessor's Parcel Number(s) assigned by the tax assessor's office to uniquely identify a property. Subdivision: enter the name of the subdivision as provided by the tax assessor's office. Tax Rate Area: enter the tax rate area as provided by the tax assessor's office. The Property Details tab provides further search definition in the Property Type, Characteristics, and Ownership areas. Select the property type(s), aka use codes, that you want to include in your search. Select All and/or Clear All make it easier to select only the property types you want. Beds: enter a minimum and/or a maximum number of bedrooms. Baths: enter a minimum and/or a maximum number of bathrooms. Square Footage: enter a minimum and/or a maximum square footage. Lot Size (SqFt): enter a minimum and/or a maximum lot size in square feet. Lot Size (Acres): enter a minimum and/or a maximum lot size in acres. Units: enter a minimum and/or a maximum number of units the property includes. Year Built: enter a minimum and/or a maximum year when the property was built. Age (Years): enter a minimum and/or a maximum number of years old the property is. Stories: enter a minimum and/or a maximum number of stories of the property. Pool: select whether the property should include or not include, a pool. Select Any to search for properties regardless if they have a pool or not. Select Yes for properties with a pool, No for properties that do not have a pool. HVAC: select whether the property should include or not include, an HVAC system (Heating, Ventilation & Air Conditioning). Select Any to search for properties regardless if they have HVAC or not. Select Yes for properties with HVAC, No for properties that do not have HVAC. Phone Number: select whether or not the public record must contain the property owner's phone number. Watch the Property Search tutorial for ideas.